This morning was our walk through, or in my case, cough through. In between checking doors, and examining the walls, I was admonishing everyone to load up on the Purell. I don't think I am still contagious, and am hoping this hacking is more due to my asthma than anything, but I wouldn't want to be hanging out with me. The interior paint colors have not all been chosen. After holding up the blue that I thought I would like in BG's bathroom, I changed my mind. It is a good thing we built a small house. If I can't choose paint colors for a three bedroom, two bath house, imagine the problems I would encounter with more spaces. 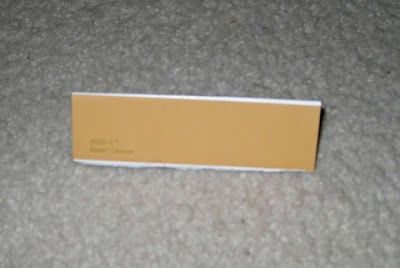 It is frightening when you start memorizing the names of paint colors. This has been my reading material for countless hours. I think this Desert Caravan by Behr will be the master bedroom color. Depending on my mood, I either love it, or think it looks like baby poo. 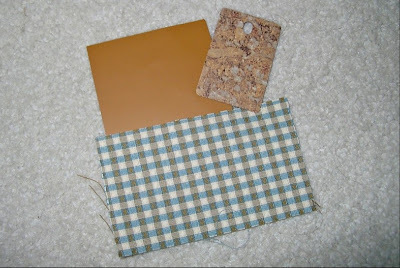 This is the kitchen curtain material that we like from Country Curtains. I have been very pleased with past purchases from that company. Besides, if I look at too many fabrics, I will get mixed up even more than I am with the paint. The counter is on the right, and the paint color is on the left. SH chose the paint color-Golden Bronze by Glidden. 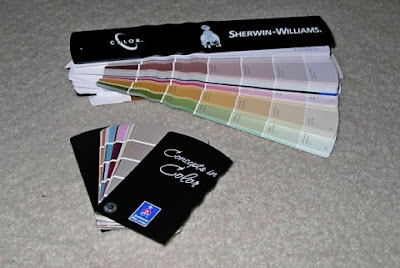 BG's room will be Sherwin Williams Potentially Purple. The laundry will be Daffodil, also by SW. The master bath will be Spiced Gingerbread by Glidden. This is possibly because I like the name. We once had a bathroom painted Happy Camper. I believe I chose that paint by the sound of the name. 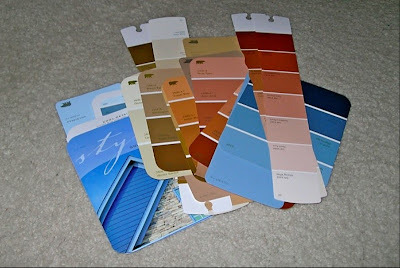 SH wants the hall and living room to be painted with various colors, just like in the model. Who wants to bet that the living room remains SW Swiss Coffee, which is what the builder used. SH is rather optimistic in his thinking that BG and I will be painting the entire house in a week. My hope is for the laundry, and BG's room to be completed by the time the moving truck arrives. I can't wait to paint! Okay, would you believe, I can't wait to move?